2. Roll out your shortcrust pastry and cut into a round circle, use a plate as a guide if necessary. 3. Lay the pastry on baking paper on a baking tray. 4. Coat the peaches in the Joe & Seph’s Madagascan Vanilla Sauce. 5. Place peaches around the pastry leaving 2cm around the edges to give yourself room to fold. 6. Fold the outer edges of the pastry over the peaches creating over lapping folds as you work your way around the perimeter. 7. Brush the pastry border with beaten egg and sprinkle the flaked almonds over the peaches. 8. Bake for 50mins until the crust is golden and the filling is bubbling. 9. 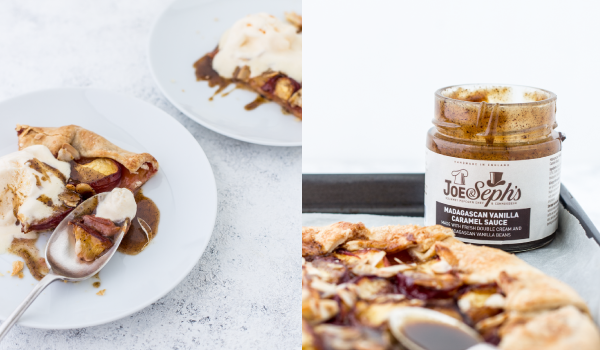 Serve with another drizzle of Joe & Seph’s Madagascan Vanilla Sauce and a scoop of vanilla ice-cream.